Astraea is honored to present the inaugural Acey Award to Reverend Gale Jones. Intergenerational work is a natural part of me, when I think about who I am right now. From the time I was a very small girl, it was elders across gender who felt an urgent need to pour something into me. I remember sitting there with them and I was a little girl and I’m thinking, ‘Why am I here?’ But they would hold me in this rapt attention as if there was something they needed to give me. 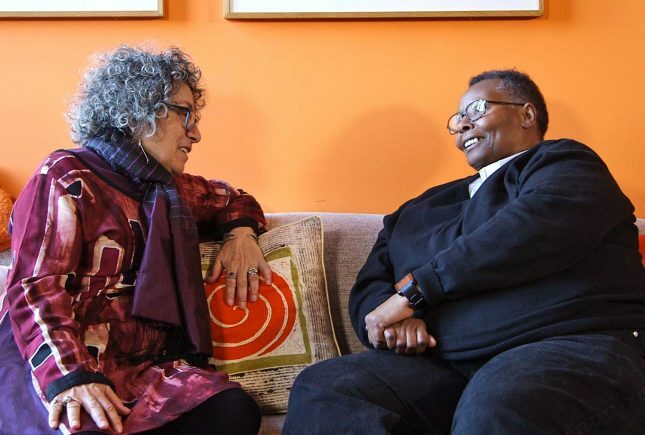 At 65 years, Reverend Gale Jones has been working for decades on behalf of LGBT people of color in the New York area, particularly working to combat the AIDS crisis and to support homeless LGBTQ youth. Born in 1950, Reverend Gale attributes her social justice awakening to the teachings of Malcolm X in early adulthood. Several years later, by then a mother, she found her way into queer organizing and the Unity Fellowship faith community. As a woman, as a queer member of the clergy in West Babylon, New York and as a Yoruba Priest, Reverend Gale has always sought to draw the margins to the center of Christianity and to use faith to spark and sustain activism. There’s a tremendous resilience and a tremendous commitment to taking care of each other in any way possible [among LGBT elders of color]. That gives me heart. Watch a conversation between Reverend Gale Jones and Katherine Acey by clicking the image above.